Our Raw Steel 2 Way with 2 Straight Arms Rack is sure to add a touch of style to your showroom floor. Our Raw Steel Collection features a mottled brushed metal finish with welded corners. Adjust the arms into different positions to highlight your apparel on multiple levels. 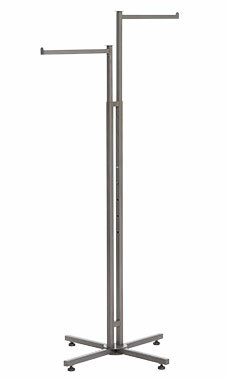 Our Raw Steel 2 Way Rack features push button arms that make it easy to adjust from 48" to 72". All of our Boutique Clothing Racks come standard with flat caps. Customize your rack by adding one of our four Finial designs. Finials easily attach and detach at the top of the rack allowing flexibility.